Appearance - Opossums are typically about 2 - 3 feet long from nose to tail tip, weighing anywhere from 4- 15 pounds (about the size of a large house cat). Opossums have gray bodies and white faces, with pointed snouts. They have long, hairless tails that are used to wrap around tree branches. Behavior - opossums are marsupials that thrive in both wooded and suburban areas. They will eat almost anything, adding to their ability to flourish and reproduce in suburban areas successfully. There is a reason why these creatures have been around since the time of the dinosaurs. Roadkill, grass, fruit, garbage, insects, birds and snakes are just a few items that comprise their diet. As a survival mechanism, they often play dead by curling up on their backs. They're also well known for baring their teeth and hissing. This behavior is often mistaken for rabies. Opossum sightings will most likely occur at night since they are nocturnal animals. You may not see an opossum right away and may instead find your garbage can tipped over and eaten, or find birds or snakes dead in your yard. If you are outside at night, you might see one scurry away after finding a meal. These are both ways to identify if you have an opossum problem on your property. Since opossums do not discriminate when it comes to diet, there are a few things that homeowners can do to discourage opossums from frequenting your property. Most importantly, do not leave trash outside your home, especially at night, and always make sure your trash bins are completely closed up. If you have fruit trees on your property or a garden, your property may be more likely to be targeted by these creatures. Opossums can be great assets to any property as they are only of the only species that feeds on tIcks, but cannot contract any tick-related diseases. Other than this small fact, having opossums on your property can be a nuisance, and they need to be moved promptly. Although it is a common misconception that opossums spread rabies, they are actually less likely to spread this disease than other animals such as raccoons and household pets. However, more commonly, opossums in are notorious for spreading fleas. Fleas are a major problem, and an infestation can break out very quickly. Because opossums will bite and claw if they feel threatened, it is important that property owners do not take removal into their own hands. 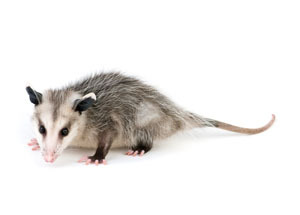 A professional wildlife removal technician is trained in humanely and efficiently handling opossum removal.